Meticulously arranged cutlery to please the senses, well before the feast was laid out in front of your eyes. Sometimes in life, when you’ve lost the zest, go for some Zing instead! This here being the SECOND restaurant to be featured from the list of 8, Zing @ Grand Millennium Hotel situated next to Pavilion Shopping Centre in Bukit Bintang, Kuala Lumpur offers 8 dishes for 8 pax per table, at RM888+ for the same period of time (20th January 2011 – 17th February 2011). 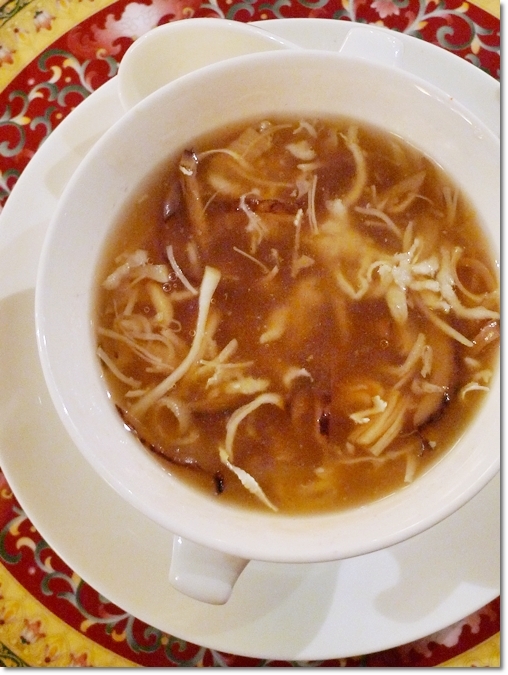 Read the post on Shanghai @ JW Marriott Hotel for a better idea on how this offer works. Elegant. Majestic. Opulent. Stylish. Classic and Contemporary. Pampered. I was a klutz. I never noticed that this hotel next to Pavilion, opposite of Fahrenheit 88 is named Grand Millennium, albeit the many times I have walked past and choked on the smogs from the traffic. The omnipresent barrage of vehicles zooming along Jalan Bukit Bintang; and though I was not stuck in the traffic prior to the dinner, I was caught up in the congestion AFTER the meal. So be warned. Anyway, the Standard Chartered Extravagant 8 Menu extends to all Standard Chartered Bank’s credit card holders; a rather irresistible offer of approximately RM111+ per pax since the 8 restaurants featured are by no means pushovers; but amongst the BEST dining establishments in KL. 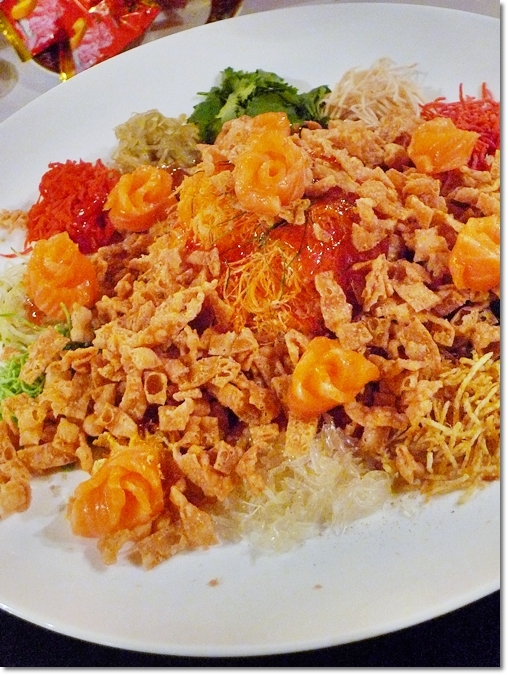 #1 – Yee Sang with Norwegian Salmon – Artfully done, tasteful slices of thick and fresh salmon shaped into pretty morsels before being tossed like all #$%@ broke loose, sorry had to censor since we can’t use unceremonious words during CNY …..
#2 – Thick Broth with Sea Treasure – A combination of fish lips, scallops, shredded chicken meat, sea cucumber and some other ingredients (okay, I forgot) in a very thick broth; almost like a version of shark’s fins soup but remember for all the 8 restaurants featured, Standard Chartered actually advocates for NO shark’s fin at all! Conservation of the poor sharks indeed. 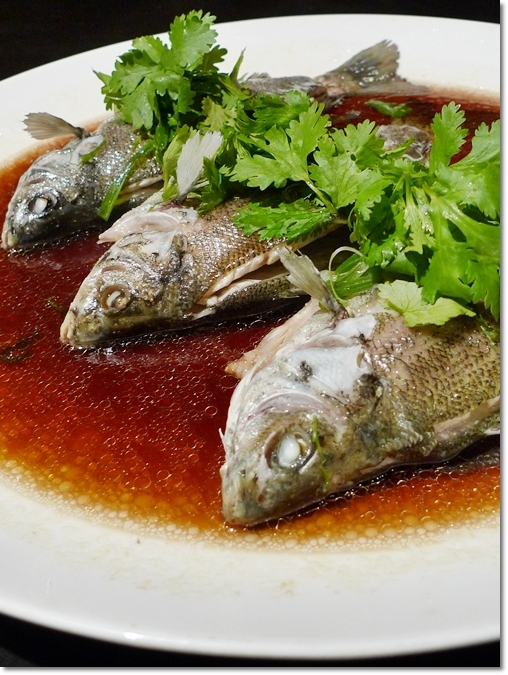 #3 – Steamed Live Fresh Cod with Soy Sauce – Surprisingly, we were served with three unrecognizable fish on a plate. Looked to be nothing like the usual cod, these miniature cod live in fresh water instead. 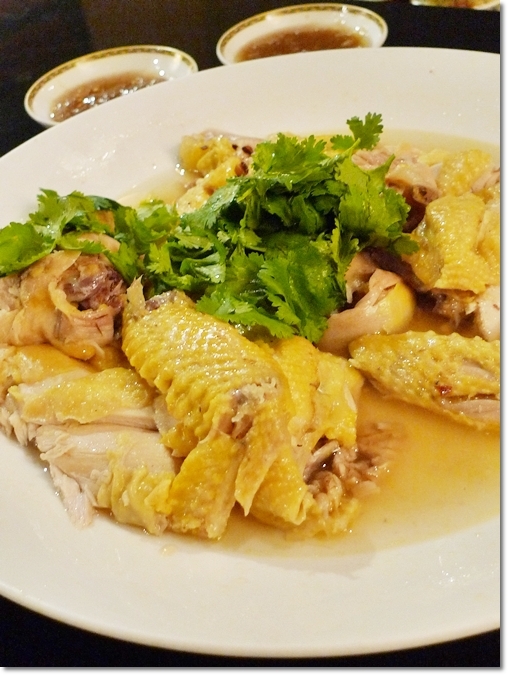 #4 – Poached Marinated Farm Chicken with Chinese Wine – Using “Choy Yin Gai” or farm chicken with lesser fat content (read : lean and healthy), the chicken had this beautiful golden hues on their skin, marinated with Hua Diao wine before the cooking process. Sadly, the meat came up very tough, and if you’re one who likes your chicken to be extra smooth and slithers down the throat, you’ll have some hassles here. But the plates of mashed ginger served alongside this fowl were great; almost to a caramelized extent without the sharp, pungent taste of the usual ginger. 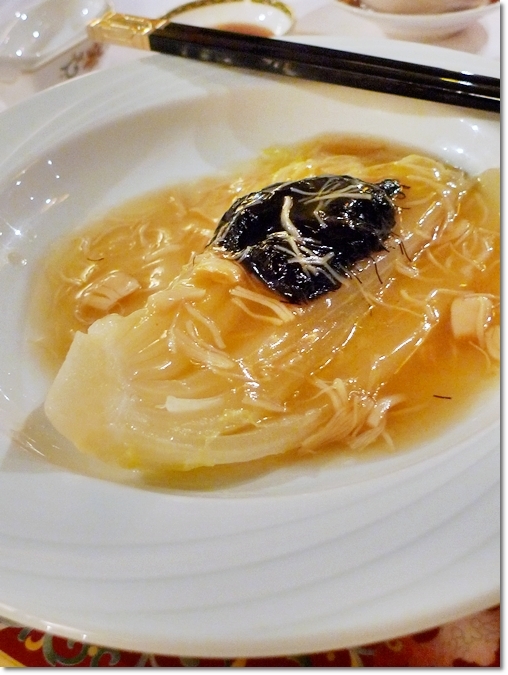 #5 – Braised Chinese Cabbage with Sea Moss and Dried Scallops Sauce – To make us eat our vegetables, we each got an individual portion of tender Chinese cabbage swimming in a bowl of slightly saltish dried scallops sauce and a dollop of sea moss. 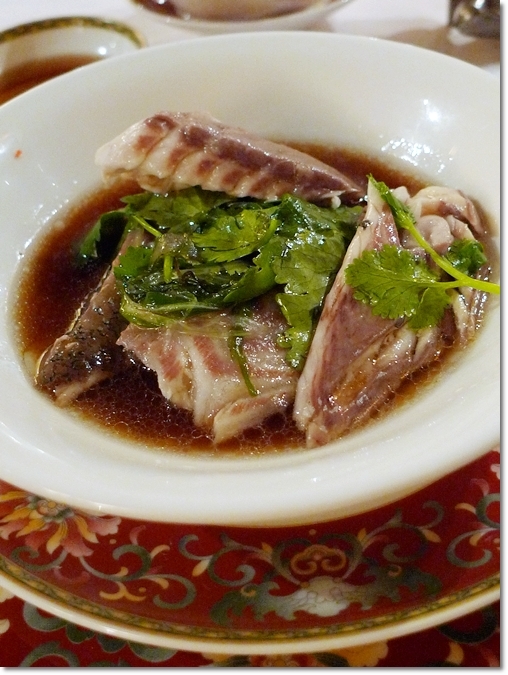 Definitely for the prosperity notion of the dish; but the briny flavours from the stock was overwhelming. Just don’t sip on the broth so much, and you’re good. 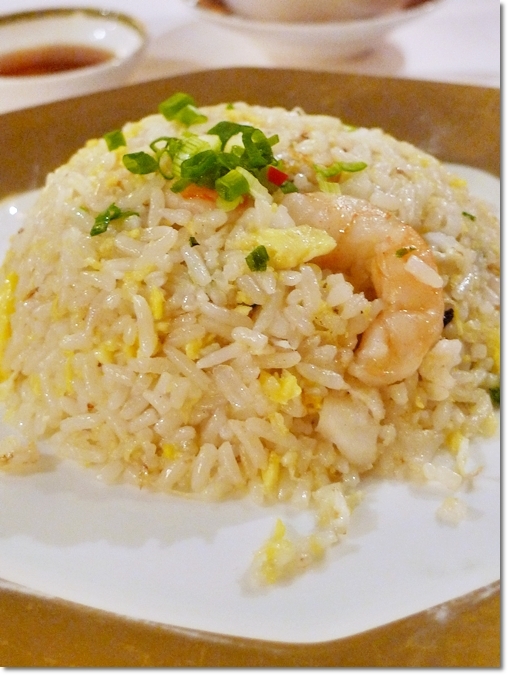 #6 – Seafood Fried Rice – Simply astounding how good chefs fry their rice to an almost perfect texture; light and fluffy without the need to douse the grains in oil. I polished my portion clean, though usually the rice got nobody’s attention in banquets. Under-rated gourmet wonder, this one. #7 – Combination of Chilled Mango Puree with Pan Fried Nian Gao – The BEST Mango Puree dessert since the ones I have had in Hong Kong. And no, I don’t mean Hui Lau Shan (for that is over-rated too). “Yeong Zhi Kam Lou” SHOULD be done like this; a refreshingly chilled puree with sweet mangoes from Thailand mixed with juicy bits of pomelo from …. Tambun of Ipoh. Wasn’t I the proudest Ipohan that evening! The fried glutinous rice cakes looked like mere sides and blah … BUT one bite into those and we felt head over heels in lurve …..
Erm, there was no eighth dish for the night, but we were served with a perfect blend of Pu er Tea, just that the tea was cold instead of hot, or lukewarm from the intense air-conditioning. Something Zing can look into, as I prefer my Chinese tea to be of at least warm temperature. 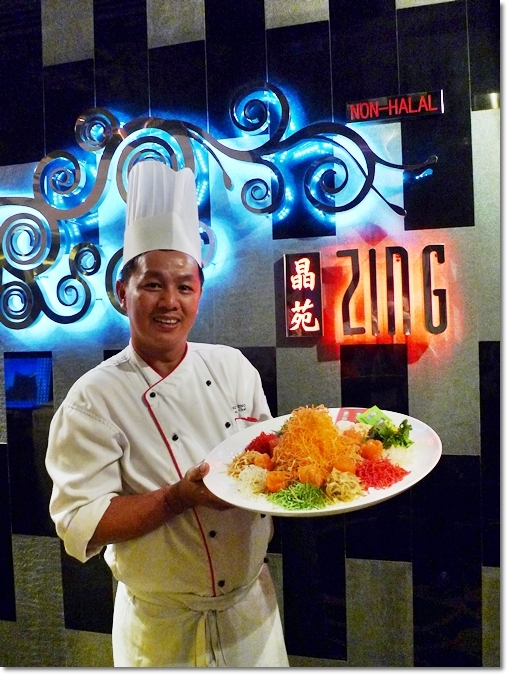 The Proud Chef from Kuala Kangsar in Perak – Chef Leong Weng Heng with his creation for the Lunar New Year. Now now ….. wouldn’t YOU wanna inject some ZING to your life before ushering in the year of the Rabbit? 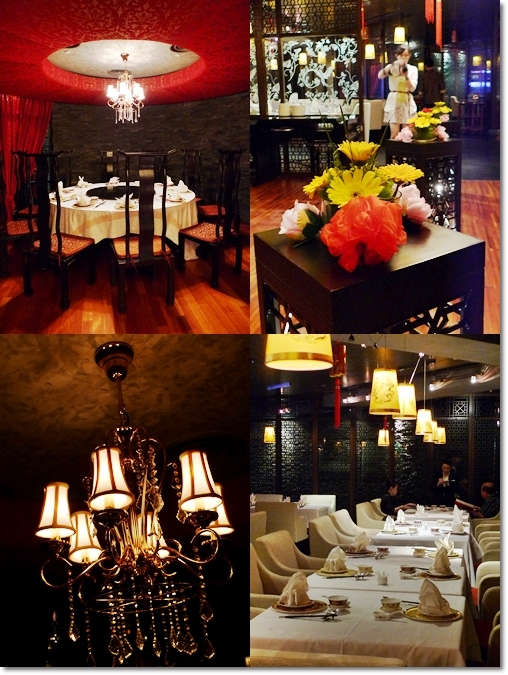 *Zing is located at Grand Millennium Hotel (www), directly facing Fahrenheit 88, and next to Pavilion. *Thanks to Standard Chartered Bank, Meena/Tim, & Zing @ Grand Millennium for extending the invitation. We are the lucky ones …. Hahaha … imagine seeing William and Chris picking all the bones non-stop …..
Nice food! So only Std Chartered members get this RM888+ package? A special offer for StanChart credit card holders. But of course, these restaurants are offering different CNY menus too. Just call up and enquire if you’re not with StanChart. I prefer this one than the JW Marriott. Looks and taste nicer. 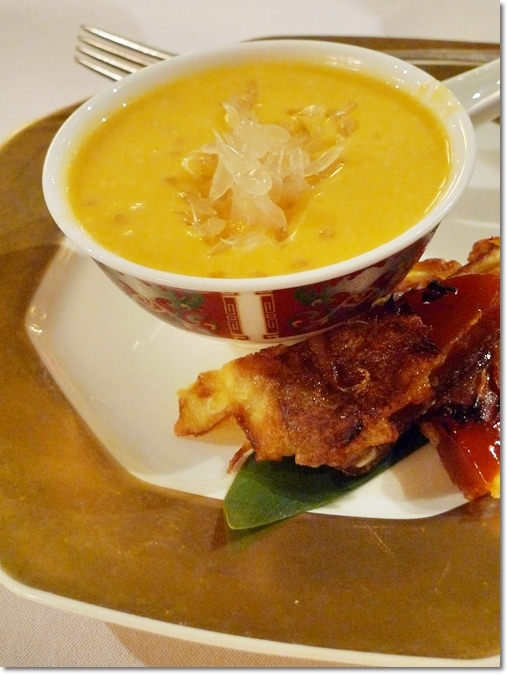 love the mango puree, sure taste delightful. That mango puree was almost too good to resist. No matter how full you may be. River cod fish? Hmm first I’ve heard of and seen those! Er how come no 8th dish? 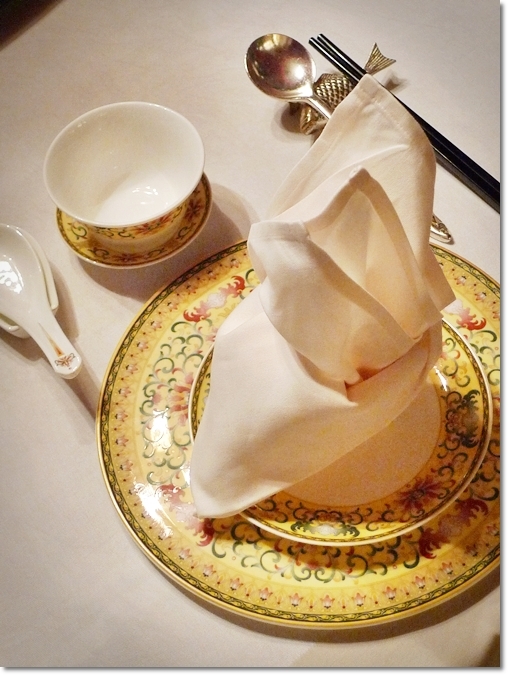 The Pu-Er Tea, OR the double desserts could be considered as such …. I guess. Yeah, we were equally as puzzled, since cod usually are BIG and cut up into slabs to be served. The steam fish looks like Barramundi. 1st time i’m looking at miniature cod… i think the regular giant ones would be my preference, hehe! I’m fascinated with the river cod fish, does it taste like normal cod fish?? Not really, but almost. Thankfully there was no unpleasant muddy hint to the flesh, like most river fishes. The Norwegian salmon and steamed cod fish caught my eye! Must have been really yums.